LIVESTRONG raised $2.5 million last week to support the organization’s free navigation services for people affected by cancer at 15: An Evening with LIVESTRONG, a star-studded gala attended by 1500 guests at the Austin Convention Center. In addition to funds raised at the event, between Oct. 17-19, LIVESTRONG received nearly $240,000 in online donations with an average donation of $94. The total number of donations is double what it was for Oct. 10-12 and the average donation increased 13 percent. 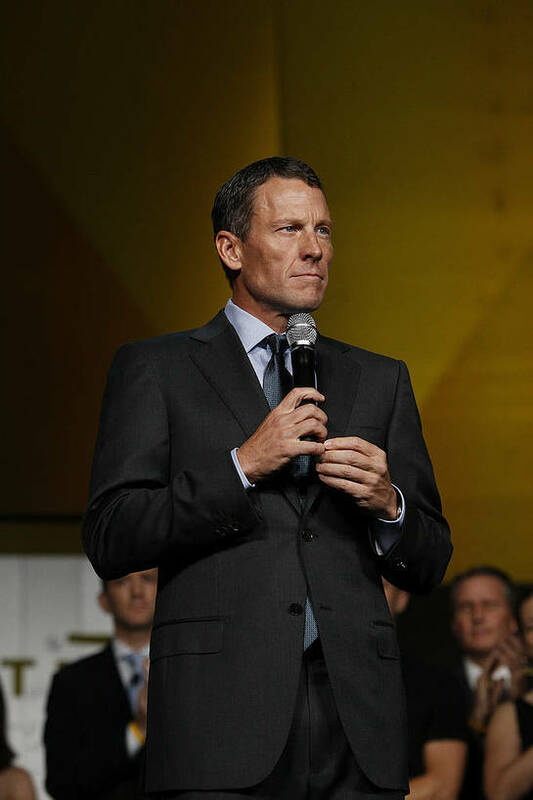 Lance Armstrong, cancer survivor and LIVESTRONG founder, was joined on-stage by LIVESTRONG President and CEO Doug Ulman and employees of the foundation, many of whom are also survivors. 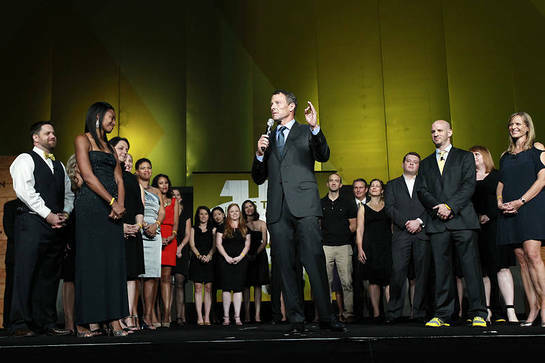 Lance Armstrong is joined on-stage at LIVESTRONG's 15th anniversary gala by Doug Ulman, LIVESTRONG President and CEO, and the foundation's staff, many of whom are cancer survivors. Armstrong addressed the audience, saying, "I’m so humbled by the outpouring of support tonight and throughout the 15 year history of LIVESTRONG. During the last few days a lot of people have asked me how I am doing. And I’ll tell you, I’ve been better, but I’ve been worse. “The idea of starting a foundation that helps people affected by cancer was born at a local Mexican restaurant in 1996. And I never imagined then that I’d be standing here tonight, in a room with 1500 people united behind the LIVESTRONG cause. “In the beginning, we only knew we wanted to help people. And from those good intentions the foundation has grown to an institution that has served two and a half million people facing cancer. Today, the foundation specializes in two things: advocacy for policies and funding that fight cancer and serve people; and direct service that helps patients and their families overcome the financial, emotional and physical effects of a disease that touches all of our lives eventually. “Tonight is all about those direct services, or patient navigation services, as they are known within the cancer community. Your support of this foundation during the last 15 years has been nothing short of inspiring. And my family and I are deeply grateful. “The people on this stage tonight have infinite hope. The people in this room have infinite hope. And the people we serve need infinite hope. Participants in the evening’s program also included Norah Jones, Stephen Marley, Sean Penn and Robin Williams. Guests dined on courses designed and created by “Top Chefs” Richard Blais, Antonia Lofaso, Paul Qui and Angelo Sosa. Art icon Mister Cartoon created an art installation live at the event that was available as part of a live auction. Guests at the event included grassroots advocates, leaders from the world’s top cancer organizations, corporate partners, elected officials, athletes and celebrities. LIVESTRONG’s 15th anniversary events continued on Sun., Oct. 21 with the Team LIVESTRONG Challenge, a monumental cycling event in the heart of downtown Austin. Leaving from the north side of Palmer Events Center on Riverside Drive, nearly 4,000 cyclists rode 18, 65 or 100 miles, based on their experience and fitness level.